Just about anyone who has outdoor wicker tables or any other outdoor picnic tables has to deal with maintaining it. One of the most important things people tend to ignore while preparing their furniture for use in the spring is making sure the table glass is properly cleaned and rubber feet are properly installed when and where necessary. Typically all end tables, dining tables and dinging tables all use glass tops to provide a flat surface rather than using the resin, metal or wood surfaces. The glass serves as an aesthetic table part to be able to see through to the furniture or area underneath. It also provides a flat surface to set your wine glass or other items on so they won’t tip or spill. Glass is easy to clean. It also provides a great surface to easily maintain for cleanliness which is very important when used for dining. On some tables the glass is inlayed. That means that the glass sits inside a frame so that the outer frame of the furniture sits level with the top of the glass once it is laid into the inlay. This type of glass top will not slide or move about under normal use. On most other tables, the free standing glass top just sits on top of the table. For these types of tables, it is usually necessary to do something to keep the glass from sliding around or sliding off the table. Position your glass table top on the table or safe flat surface so that it won’t move while cleaning. Clean the bottom side first. Use a good quality glass cleaner or your favorite home recipe using a good absorbent cotton cloth or clean paper towels. Be careful not to leave finger prints or cleaning streak marks on the glass bottom as you maneuver it’s into place. Clean dry cotton or rubber gloves will keep the oils from your hands from marking the glass. After you have cleaned the back and placed it on the table, now its time to finish up and clean the top. After you have cleaned the bottom of your glass top, its now time to replace or add new rubber feet. If your glass is the inlay type, you won’t necessarily need rubber feet unless your glass moves around a lot within the inlay or warbles. So, for inlayed glass, put the glass back in its place and you’re done. If you have free standing table glass, you need to inspect the integrity of the glued on rubber feet that sit on the bottom of the glass. If you don’t have any, then you should consider installing them. 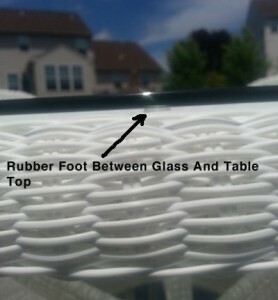 The glue on the rubber feet will tend to get soft and slide when exposed to direct sun and side presser on the glass. These rubber feet are spaced out and glued on the perimeter of the glass bottom so that the rubber feet come into contact with the surface of the table top. 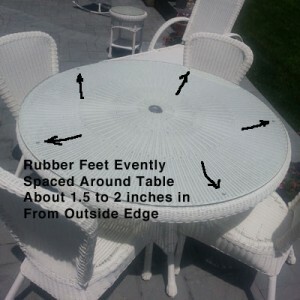 The rubber feet grip the table surface and keep the glass from shifting. If your rubber feet have moved or are missing, you need to replace them. Go to your local hardware store and find a pack of the little rubber feet. They usually come on a little pad where you can peel them off one at a time and stick them to the glass. They are very inexpensive. Install them so that the glass is balanced and does not rock. Apply some pressure to the rubber feet to make sure the glue on the foot is stuck well to the glass. Hold the presser on each one for about six seconds or more. Square or rectangular table tops less than three feet long need one rubber foot near each corner. Small round table tops typically use four rubber feet where larger round or rectangular glass table tops use five or six spaced evenly along the perimeter. Put six or more on a large oval table glass so that you have one each on the rounded ends and four in a rectangle where the straight edge ends and the curve begins. The rubber feet should be stuck on at least one inch or more from the edge of the glass so that it is in full contact with the table surface so that it will grip. Glass more than fifty inches long should have a rubber foot along its perimeter and in the center no less than every twenty-four to thirty inches apart. Note: As glass gets longer or wider, it will flex more. So, it’s a good idea to support all parts of the glass so that there is no chance of it flexing too much. Check back for our next article to learn more about bedroom furniture.